While talks of a preferential agreement between the US and EU were put aside when President Trump came in office, the presidents of the two trading partners have recently expressed a new desire to aim for zero tariffs and non-tariff measures between them. This column estimates the gains from such a deal, taking into account global value chains and input-output linkages in production. It finds that free trade would substantially benefit both the EU and the US, and these gains would result from the reduction in non-tariff barriers rather than tariffs. TTIP – Is free trade coming to the north Atlantic? During the first part of the Trump presidency, talks between the US and the EU regarding a preferential agreement, the Trans-Atlantic Trade and Investment Partnership (TTIP), were put aside and instead bilateral import tariffs between the trade partners increased. It is only very recently that the presidents of both the EU and the US have expressed their desire to aim for zero tariffs and non-tariff measures between the two trading partners (European Commission 2018).1 While these declarations seem to entail a less ambitious agenda than the agreement that was in the make under the Obama presidency,2 it conveys the political will to further liberalise trade between the EU and US. Source: Vandenbussche et al. (2018). Acemoglu (2012) and Johnson (2014) suggest that any evaluation of trade policy or a free trade agreement such as TTIP or a mini-TTIP should consider global value chains and production networks worldwide rather than bilateral trade flows alone. Building on this idea, in new research we develop a new methodology to evaluate different trade policy shocks such as free trade between the US and the EU (Vandenbussche et al. 2018). We argue that trade between two bilateral trade partners cannot be considered in isolation, but should be considered as part of a global value chain that also involves third countries trade. Take the car sector as an example. When the US steel sector supplies an input to a Mexican tire producer which is subsequently shipped to a German car assembler as an intermediate input, a US tariff on German cars will not just affect German exports to the US but will also affect US exports to Mexico. A full assessment of the effects for the US of bilateral trade liberalisation with the EU thus requires an analysis of global input-output linkages that exist between all sectors including those of third countries. The example shows that a zero US import tariff on EU cars will indirectly also affect US exports to Mexico, driven by the increased German car sector’s demand for Mexican tyres. A traditional bilateral gravity analysis between the US and EU can therefore not suffice for assessing the effects of reduced tariffs between them, since direct trade would be missing many of these indirect production linkages. Most of the earlier studies on trade policy shocks, and TTIP in particular, rely on simulating a single-sector computable general equilibrium model with perfectly flexible labour markets and full employment. While these studies are very useful in generating long-run estimates at the level of the country, they offer little guidance when it comes to the short-run impact.4 In the short run, economies only slowly move to a new trade equilibrium because it takes time for wages to adjust and for supplier networks to change. Labour markets do not perfectly adjust and unemployment exists. Thus, there appears to be room for a study that documents the short-run impact that the EU and the US are likely to experience on their transition path to a long-run new equilibrium. A short-run impact assessment then allows for estimates on job gains and losses. Below we describe the results of a short-run study on the effects of more free trade between the EU and the US, which corresponds to a mini-TTIP. We document the potential employment effects on both sides of such an event. We develop a Dixit-Stiglitz ‘love for variety’ trade model with input-output linkages at sectoral level. This generates a network model of trade in value added5 that incorporates all global sectoral input-output linkages. The approach is a multiple sector one and focuses on the short-run impact of trade liberalisation. The advantage of using input-output data is that Leontief input-output coefficients are available which trace all the upstream input linkages in order to clearly separate the foreign from the domestic content of sectors. Leontief coefficients are very different from technical coefficients, which are often used in other TTIP studies and only provide the origin of inputs from the first round upstream production phase. We provide a closed form analytical solution that rests on a derivation of the input-output Leontief coefficients6 with respect to tariffs. The short-run focus of the analysis implies that productivity growth and innovation which are likely to occur in the longer run are left aside, with the focus instead on the short-run trade creation effects ceteris paribus. The short-run focus also implies that we do not consider migration, foreign direct investment, supplier switching, or trade diversion that may reinforce or mitigate some of the short-run effects. The existing empirical literature on trade diversion suggests that its mitigating effects are small in magnitude compared to the trade creation effects. Our results are therefore bound to capture most of the adjustment effects. The network trade model is then calibrated using the 2016 release of the World Input-Output Database (WIOD). This database includes 43 countries with 56 sectors, of which around 30 are service sectors. Our methodology is complementary to the existing literature in a number of ways. First, it documents the short-run production and employment effects that countries will face on their transition path under TTIP. Most alternative models in the literature take a long-run approach by assuming that wages adjust and labour markets are perfectly flexible, and therefore cannot say anything on job effects that are bound to occur. We take a more short-run and pragmatic approach when it comes to employment effects of TTIP. Without explicitly modelling the labour market, but by relying on existing employment elasticities at the sector level from the literature, short-run employment responses under EU-US free trade are obtained. While the model predicts the changes in production that EU-US free trade brings, the employment elasticities at the sector level provide an estimate of how jobs will respond to changes in production.7 Wages are considered fixed in the short run and unemployment is assumed to exist such that additional jobs can be filled. Third, as the production linkages between two countries typically differ greatly across sectors, our sectoral approach yields a more precise assessment of the indirect network effects of a trade shock and how tariffs in one sector can have production spillovers in other domestic and foreign sectors, as illustrated by the car sector example above. We find that a mini-TTIP can boost bilateral trade between the EU and US, as well as permanently increase production in value added and employment both in the case of a shallow and a deep trade agreement. A shallow trade liberalisation is assumed to involve zero tariffs while NTMs remain at their current level. A deep trade liberalisation is assumed to additionally reduce 50% of the existing NTMs. This is justified by the idea that not all NTMs can be reduced since some arise because of language and cultural differences that are unlikely to change.9 The results of more EU-US free trade under a shallow versus deep mini-TTIP are summarised in Table 1. In comparison to the literature, the short-run effects shown in Table 1 are somewhat smaller than the longer-run estimates that circulate in earlier literature (Felbermayer 2016). In the short run we expect an increase in GDP of 1.3% for the EU and 0.79% for the US in the case of a deep mini-TTIP. Other studies on average find the gains from TTIP to be around 2% of GDP for the EU and about the same 2% of GDP for the US. While the short-run gains seem to already capture most of the adjustment, it is logical given that long-run studies’ gains are somewhat higher as they also consider technology updates and innovation, foreign direct investment flows, migration, and trade diversion, which can all reinforce short-term gains. Predictions of short-run job gains are around 350,000 jobs for the US and around one million jobs for the EU in the deep free trade scenario. With a multiple-sector input-output approach, it appears that the EU28 as a whole stands to gain relatively more from TTIP than the US, both in the case of a shallow and deep TTIP. One of the main underlying reasons for this result is the more closely integrated EU28 production network both across sectors and countries, which only a multiple sector approach can bring to the forefront. A new insight arising from our study is that indirect production effects are stronger whenever a sector is more upstream. This is illustrated in Figure 2 where we decompose the gains from EU-US free trade into direct and indirect effects for two countries – Germany and the US. Direct production gains are defined as an increase in domestic production in the sector coming from a tariff reduction faced by the direct exports in that sector. 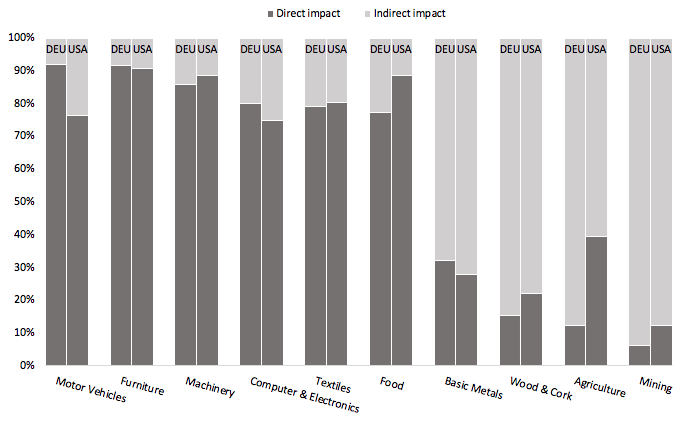 Indirect production gains come from tariff reductions in other more downstream sectors. Figure 2 shows that for an upstream sector like German base metals, the production gains from trade liberalisation come from 30% lower tariffs by the US on imported base metals from Germany, but 70% of the production gains in German base metals result indirectly from trade liberalisation in other downstream German or other EU sectors to which it supplies. The same holds for the US upstream base metals sector. In contrast, for a more downstream sector like German motor vehicles, most of the production gains come from lower US tariffs on motor vehicles. The German motor vehicles sector does not benefit much from tariff liberalisation in other sectors besides its own. When traditional gravity analysis is used to assess bilateral free trade, these indirect production effects are not taken into account as the analysis abstracts from input-output linkages between sectors. We thus show that the measurement bias arising from traditional gravity analysis to assess the economic gains from bilateral free trade agreements such as TTIP are larger whenever a sector is more upstream in the value chain and supplies to many other sectors (e.g. the case of the base metals sector). The EU country that stands to gain most (in relative terms) from TTIP is Ireland, followed by Germany, Belgium, and the Netherlands. This heterogeneity derives from the sectoral composition of these economies and the centrality of their key sectors in the EU production network. This confirms the results of Acemoglu et al. (2012) and others, who claim that it is a sector’s network centrality that determines the impact of an aggregate shock through a cascade effect in the input-output network. 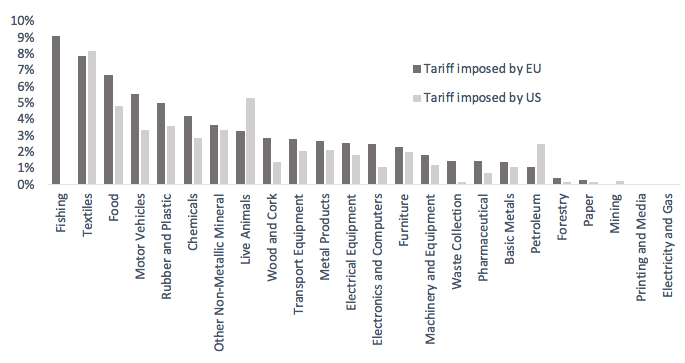 A sector that faces large tariff reductions may not have strong aggregate effects if it is not well connected to other sectors, whereas a sector facing small tariff changes can have a large aggregate impact if it is central in the economy and supplies to many other sectors. Hence, from a macro point of view, this granular approach to free trade agreements is important. Acemoglu, D, V M Carvalho, A Ozdaglar and A Tahbaz‐Salehi (2012), “The network origins of aggregate fluctuations”, Econometrica 80(5): 1977-2016. Berden, K et al. (2009), “Non-tariff Measures in EU-US Trade and Investment. An Economic Analysis”, Ecorys report for EU Commission. Caliendo, L and F Parro (2015), “Estimates of the Trade and Welfare Effects of NAFTA”, The Review of Economic Studies 82(1): 1-44. De Gortari (2017), “Disentangling Global Value Chains”, job market paper, Harvard University. Eaton, J and S Kortum (2002), “Technology, geography, and trade”, Econometrica 70(5): 1741-1779. European Commission (2018), “Joint U.S.-EU Statement following President Juncker's visit to the White House”, 25 July. Felbermayr, G (2016), “Economic Analysis of TTIP”, IFO institute working paper. Imbs, J and I Méjean (2017), “Trade elasticities”, Review of International Economics 25 (2): 383–402. Johnson, R C (2014), “Five facts about value-added exports and implications for macroeconomics and trade research”, The Journal of Economic Perspectives 28(2): 119-142. Konings, J and A P Murphy (2006), “Do multinational enterprises relocate employment to low-wage regions? Evidence from European multinationals”, Review of World Economics 142(2): 267–286. Vandenbussche, H, W Connell and W Simons (2018), “The cost of non-TTIP. A Global Value Chain Analysis”, CEPR Discussion Paper 12705. This joint declarationoccurred in July 2018 when President Juncker visited President Trump. TTIP was about liberalising trade in goods and services as well as the liberalising investment and public procurement. NTMs refer to standards and regulatory differences caused by geography, language, preferences, culture or history amongst others. Felbermayr (2016) provides an excellent overview of existing long-run computable general equilibrium studies of TTIP. The market structure that we assume is perfect competition, similar to Eaton and Kortum (2002), Caliendo and Parro (2015) and others. Input-output tables do not reflect the underlying firm heterogeneity in a sector. This discrepancy between firm-level inputs and sector-level inputs was recently documented by de Gortari (2017).But firm-level data is typically only available for one country and does not hold information beyond first round inputs which does not make it suitable for a full assessment of trade policy shocks. Konings and Murphy (2006) provide estimates of employment elasticities with respect to value added in manufacturing and services. We use existing sector-level trade elasticities from Imbs and Méjean (2017), to arrive at 16 different sectoral elasticities in manufacturing. Berden et al. (2009) provides estimates of the reduceable part of NTMs in the US-EU trade relations at sector-level and finds that on average only 50% of NTMs are reduceable.